Address: Tanjnagri Scheme Fatehabad Road, Agra, Uttar Pradesh, 282001. Access: 12 kms. from Airport, 10 kms. from Railway Station, 10 kms. from Bus Stand . Facilities: Single A/C 139, Single Total 139, Suites A/C 1, Suites Total 1, Total A/C Rooms 140, Total Rooms 140, Centrally Airconditioned, 2 (Can be made into one hall, 35, 35, 1, 1, Indian, Continental, Room Service, H/C running water, Telephone, Fax, T.V., Safe Deposit, Channel Music, Tea/Coffee maker, Fire Alaram System, 20- channels on television, Hair Dryer in room, stand by sef Generated Electricity, E-mail and Internet facilities, Banquet Facilities, Conference Facilities, Beauty Parlour, Shopping Arcade, Swimming Pool . elegant low rise hotel is situated in six acres of beautiful gardens. The central countryard and stone work at the hotel is reminiscent of the Mughal era. Caring for the guest is developed to a fine art.Designed around you,the hotel provides an ideal venue for meetings,seminars and conferences.Additional facilities include 24-hrs room service, a travel desk, beauty salon and a gift shop. 139 Well appointed rooms and suites centrally air-conditioned rooms are equipped with mini bar, tea and coffee making facilities, electronic safe, direct dial telephone, colour television and satellite transmission. And some rooms are specially designed for the physically challenged persons. What do you think about Trident Hilton Agra? I really liked this hotel. It's a nice quiet oasis in Agra. Agra is a small town/city its got Taj Mahal and Agra fort which are amazing so worth a stay. Location of hotel was great and central, breakfast buffet (included in price) was super amazing with fresh juices made to order omelets and just about everything in between. Rooms were nice and our view was beautiful (they have a nice pool and beautiful waterfall). The bar is very nice too and overall place is great. We even went to the beauty salon and got threading done for dirt cheap prices (well for western standards). It's important to stay in this type of hotel in Agra because besides the main tourist attractions, there is not much else to do. Typical Hilton (ex Hilton now Trident). Very nice pool are and excellent rooms. I think it has its own power as we had a couple of very short power cuts when the generator seems to kick in. Over all its just a good hotel and very near to the attraction. All i can say is for the price its good <3000INR. Do not buy water in the restaurant its 85INR and that's a rip off. The bar is expensive by India standards. Expect to pay 650INR for a beer and cocktail. Food cost us 2000INR for the buffet for two with the shockingly priced water. We stayed one night and could have been at the Hilton in Peoria, not that that is really bad. The rooms were clean and well equipped. There is nothing really in the area except a fairly uninteresting mall a couple of blocks away. We did not eat at the restaurant but I never saw so many white chef's hats and so few customers. Service was great to us but the doorman really tried to run off the driver we hired, that was irritating. We stayed in this from now on non-Hilton hotel for two nights after travelling extensively in Southern India and Delhi for 10 days. Great and tranquile relaxing haven in-between the hot-spot days. Relaxing facilities including the swimming pool area, a gym-converted room with adequate workout equipment and throughout great service in a hotel, which does not encourage tips for its staff. Rooms are excellent and quiet. Mini-bar bit-overpriced as well as the usage of business centre internet connection. Breakfast buffet with all the task-waiting (omelett etc) chefs one of the best ones anywhere. Bar bit overpriced, but with an ok variety. Only a few blocks away from two modern shopping malls with great variety of good-value shops and cinemas. Easy access to Taj Mahal. A reason to take a rest for an extra night in Agra after seeing the must sights and continuing to the next hectic spot. ok this was a posh hotel we were staying in as a break from our back packing travels around northern india. We didnt stay here for perhaps long enough to get a good feeling for the place - about 13 hours in total(!) but my impressions were mixed. Check in was perfect - the girl behind the front desk was excpetionally polite, despite us getting all sorts of stares when we pitched up in dirty clothes and with rucksacks (we'd just done a 400km drive). The room was quite small, smelled a little damp, but had running hot water which was welcome. The food was good despite being overpriced, as was the bar. We had hired a young driver from Haridwar to take us to Agra then Jaipur. One of the Concierges at the Trident tried to convince us to ditch our driver in favour of someone he knew - quoting us the same amount of money to drive the 240km to Jaipur as we had gotten for the 600km journey from Haridwar. He also tried to make us believe that our driver had not shown up in the morning, until i confronted someone else about it and funnily enough it transpired he had been waiting all along - hardly the sort of behavoir you expect from a top end hotel. This sort of profiteering at ours, and our drivers expense left a bitter taste. This is definitely a paradise in the middle of a rather ugly city. When the 6 of us arrived at the Trident in our mini-bus we all said "WOW!" at the same time. The new lobby and restaurant decor (it was only 24 days old when we arrived) is stunning and very artistic. The minimal clean lines combined with Indian art pieces works very well together. The restaurant had been extended by the time we arrived and was very welcoming and the food was excellent, both buffet and a la carte. The staff is extremely well-trained, polite and discreet, yet friendly. One of the waiters overheard us raving about the decor in the restaurant and came over to proudly tell us that it was newly renovated. The value for money can't be beat. We stayed at this hotel for one night last week of November. The hotel had a nice European look and feel in the lobby area. The checkin was great, and we were upgraded to a suite on the 2nd floor. The staff was courteous, attentive, and well trained. The suite was quite spacious with nice views of the garden. Our stay was short (to see the Taj Mahal) and we didn't have the time to use any of the facilities except the great restaurant where we indulged in the dinner and the breakfast buffet. The dinner dishes were great, with the best tasting goat curry, and dried paneer I've tasted on this trip.The room amenities were excellent, but completely overshadowed by the view out the french doors! A really nice touch was the delicious birthday cake and candle the hotel provided. The hotel also provides "golf buggies" to transport you to the Taj Mahal since motor vehicles are not allowed near it. The Trident Hilton Agra, is a good hotel. From the moment you walk into the newly refurbished lobby you get a good feel. This is then confirmed when you look out into the enclosed pool and garden area. While we were there the restaurant and bar were being refurbished but we saw enough to know that once this is complete the hotel will be very modern and comfortable in the public areas. Very good bargain. 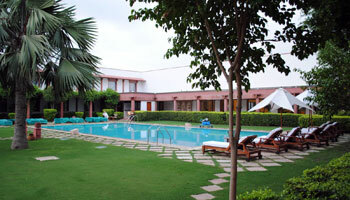 Rooms clean, nice pool, very peaceful and close to the Taj Mahal. Strongly recommend anyone going to see the mausoleum to stay there.